From Monograms to Soaring Eagles, Charging Buffalos or Polar Bears. 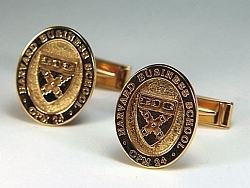 Cuff Links and Studs for that special event, are the ultimate finishing touch. 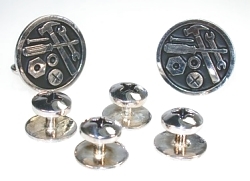 In addition to the hundreds of unique cufflinks we offer five shapes for custom monogram links and studs. We pride ourselves on our customer service, please don't hesitate to call 1-888-RARU-COM or 1-888-727-8266, 9am - 5pm EST or email our graphic designer with questions about a deSign. We can create a sketch for your approval. 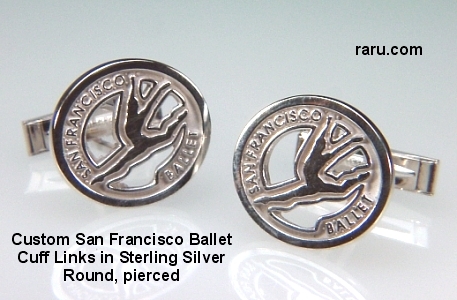 Available in Sterling Silver, 14KT, 18KT or platinum. Many of the examples shown are for specific organizations and their logos can ONLY be produced for members. 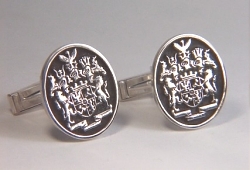 14KT white gold enameled flag cuff links. Custom graphic/mold and enameling fees apply. 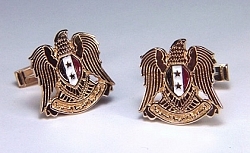 Shown in 14kt yellow gold with red, white and blue enamel. Custom graphic/mold and enameling fees apply. Example only - not for sale. 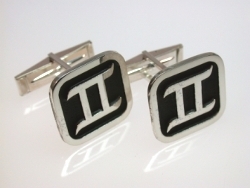 Square cufflink with the symbol for Gemini. 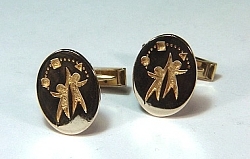 Visit our Astrology Jewelry page for other ideas. 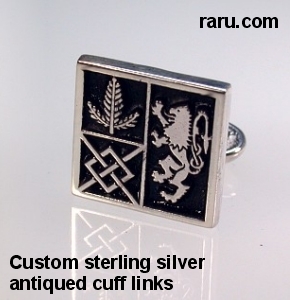 Sterling Silver, regular etched pattern. 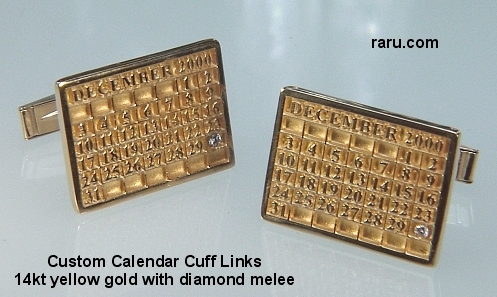 14kt yellow gold photo etched cuff links - reverse etch. 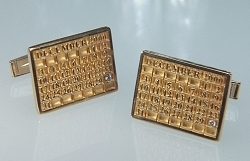 14kt yellow gold oval cuff links. 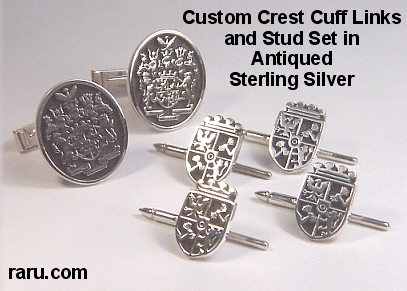 Antiqued sterling silver cuff links. 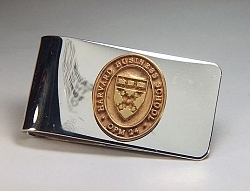 We also offer Custom Crest Rings. 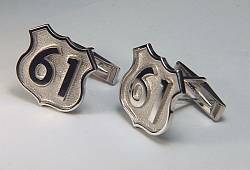 14kt white gold photo etched cuff links. Virtually any design is possible and may be created in sterling silver, sterling with 18kt vermeil, 14kt, 18kt or platinum. One time non-refundable custom graphic fee applies. Available in Sterling Silver $ 89.95, Karat Gold as per quote. 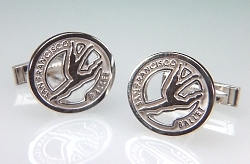 We also carry grape leaf cuff links along with may other wine related cuff links and studs. Please visit our Specialty Jewelry page for other ideas. 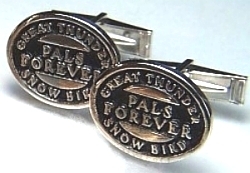 We also create emblematic jewelry for groups and associations. 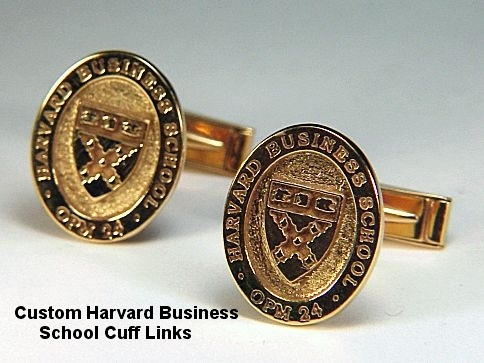 These cuff links were created for members of the Harvard Business School. Matching money clips. 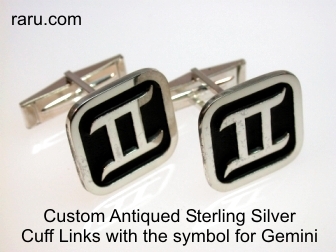 We will gladly recreate your sports team's logo in Sterling Silver, Vermeil or Gold. Most any type of jewelry is available from pendants to key tags and tie tacks to cuff links. Custom graphic fee applies.